So says search engine giant Google, which has named the island its “eCity” for Washington state. According to Google, the eCity accolade — awarded for the first time this year — is based on the extent to which businesses in the community utilize the Internet to connect with customers. “The winning cities exhibited strong engagement and potential for growth within the digital economy,” Google representative Sam Smith said in an email. Businesses with a Web presence are expected to grow 40 percent faster than other companies, according to a statement from Google. Google worked with research firm Ipsos to compile the list of 50 eCities. According to the methodology provided on the Ipsos website, a shortlist of five cities was created for each state, based on the number of AdWords customers in relation to the city’s population. AdWords is a Google advertising product. Once the shortlist of AdWords-friendly cities was in hand, Ipsos analyzed a random sample of 51 small- and medium-sized businesses from each city. Businesses were scored based on a number of criteria, including whether they were listed in online directories, had websites, cultivated a social media presence or sold goods online. Scores were tallied and Bainbridge Island came out on top in Washington. Announcements of the eCities are being rolled out at events across the country. An event for Bainbridge Island will be Friday at Bon Bon, a Winslow Way candy shop organizers say exemplifies the kind of online integration the eCity award recognizes. 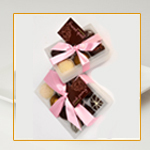 Bon Bon has a website, blog and social media pages, and it sells fudges online. ‹ Come See Us at our New Location.